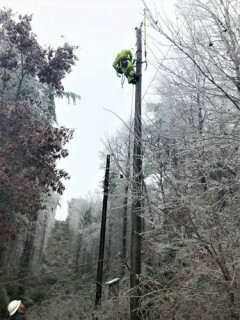 Over 100 additional line technicians and contract crews are now assisting 75 Blue Ridge Energy crews in a full force effort to restore power from today’s ice storm. Assisting crews are from: EnergyUnited, Rutherford Electric Membership Corporation, Union Power Cooperative, Randolph Electric Membership Corporation, Surry Yadkin Electric Membership Corporation, Carter Tree Service, Asplundh Tree Expert Co. and Sumter Utilities, Inc.
Due to wide-spread damage to the system, Blue Ridge Energy is advising members in the hardest hit areas of Ashe and Alleghany counties to be prepared for restoration work to continue overnight, Friday and into Saturday. 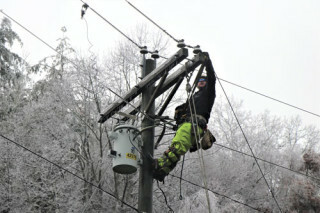 Thousands of members have been impacted by today’s storm and line technicians are battling icy conditions. This has resulted in downed trees and large limbs on power lines, causing damage and outages scattered all across the electric system. Currently as of 4 pm, members impacted are as follows: 3,778 in Ashe County; 1,459 in Alleghany County; 260 in Watauga County; 78 in Wilkes County; and one in Caldwell County. Outages are fluctuating as crews get power restored in certain areas but weather conditions, including ice melting off limbs and falling into power lines, lead to new damage and outages in other locations. As the storm continues to progress, Blue Ridge Energy encourages members to remember to report outages at 1-800-448-2383 or over the Blue Ridge Energy mobile app. Outage updates are available any time on the cooperative’s live outage map at www.BlueRidgeEnergy.com or on the mobile app. If members encounter any downed lines, stay away! Downed power lines can remain energized. Contact with them can be dangerous, or even deadly. 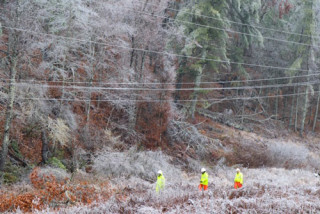 Members are urged to report any downed lines to the cooperative at 1-800-451-5474 or call 911 immediately.